All-on-4™ is a revolutionary approach developed by Paulo Malo. With the All-on-4™ procedure, placing a dental implant can be a quick and minimally invasive procedure. With the All-on-4™ technique, anyone can have beautiful new teeth in a day, even if you have been told you are not a candidate for dental implants or are lacking enough bone for implants. It can usually be performed despite health conditions, such as diabetes, osteoporosis and other conditions that limit the capability of bone grafting. Leave us a message and we will endeavour to get back to you within 24 hours. 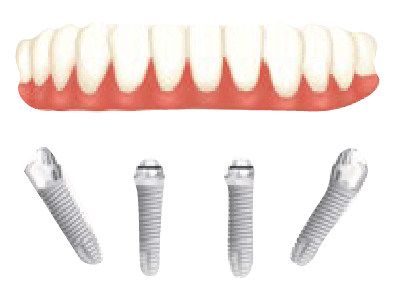 All-on-4™ is a dental implant technique used to provide patients with fixed (non-removable), highly aesthetic and functional teeth within 24 hours, in most cases. It consists of placing 4 implants in the upper or lower jaw and a fixed bridge that will be supported by those 4 implants: (All the teeth in one jaw on 4 implants). What is the difference between All-on-4™ and dentures? The All-on-4™ technique provides patients with fixed (non-removable) teeth. For this reason the patient will clean and maintain the fixed bridge in a similar way to natural teeth without needing to remove it after eating or at night time. The fixed bridge provided using the All-on-4™ technique will enable the patient to bite down in a similar way to natural teeth, allowing the patient to enjoy certain foods that dentures wouldn’t allow them to eat comfortably (like biting on an apple). The fixed bridge won’t move around like a denture does, providing comfort and confidence while speaking. The surface of the gum covered by the All-on-4™ fixed bridge is minimal compared with the surface covered by a denture. This and the fact that the fixed bridge does not cover the palate provides the patient with multiple benefits: no gag reflex, less irritation in gums and soft tissue, no altered or reduced sense of taste, and no altered sense of temperature. What is the difference between the All-on-4™ and other implant techniques? The All-on-4™ requires four dental implants in most cases. Other techniques could require up to 12 dental implants per jaw, resulting in a more invasive, lengthy and expensive procedure. The use of more implants means that they are closer together, which could result in a greater chance of complications or implant failure in the future as the space between implants is smaller, making it more difficult to clean and maintain. The All-on-4™ technique reduces the need for bone grafting surgery due to the position of the implants. This reduces the cost of the procedure and gives the opportunity to patients with bone loss to have this treatment done even when they have been told that they lack enough bone to place implants using other techniques. No bone grafting also allows most patients to have their fixed trial bridge within 24 hours of placing the implants, unlike other techniques where they would have to wait 6 to 18 months before having fixed teeth. Am I a good candidate for the All-On-4™ procedure? The All-On-4™ procedure is indicated for edentulous patients (who have lost all of their original adult teeth), near-edentulous (missing most adult teeth) or are suffering from a failing dentition as a result of advanced periodontal (gum) disease or other medical conditions. Many have existing loose or failing bridgework and others are denture or partial denture wearers. 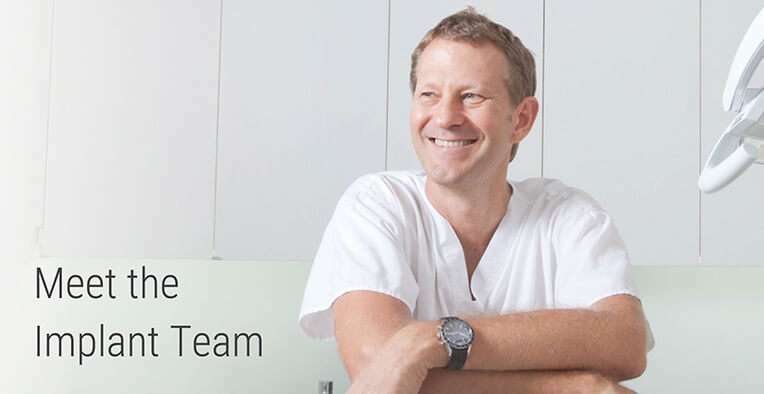 What does the All-on-4™ procedure involve at Rotondo Dental Brisbane? Getting fixed teeth with the All-on-4™ technique typically involves one or more initial consultations with our experienced general dentist and with our specialist Dr. Tony Rotondo who will perform the surgery. Within the next 24 hours after the procedure, you will have fitted your trial fixed bridge. After that, you will attend a series of scheduled follow-up and trial appointments during which we ensure that your implants are healing properly, your fixed trial bridge is functioning optimally and you new, final bridge is being made. Once you have finished your treatment, we offer a complementary hygiene appointment to show you how to properly clean and maintain your fixed bridge. How much time should I take off from work to have this procedure done? We typically recommend that you take between 5 to 7 days off after the procedure, depending on your occupation. You will be given a comprehensive explanation of the medication and care that you will need for the following 7 days after the surgery. Is the All-on-4™ procedure painful? The use of sedative medications and local anaesthetics ensure that you are kept entirely comfortable and pain and anxiety-free during the All-on-4™ procedure. As with any surgery, you can expect some post-operative discomfort, but we will send you home with prescription analgesics (pain-killers) to help manage this. In most cases, this discomfort is minimal. You also have the option to have your procedure under General Anaesthetic at St. Andrews Hospital if you prefer to do so. What payment options are available at Rotondo Dental Brisbane? We offer different payment options including fortnightly and monthly payments plans. We also offer discounts for upfront payment. For further information please contact us on 3229 9333 to discuss your options in detail. Rotondo Dental Brisbane is a partnership between a distinguished, local, specialist dental practice and Malo Clinic worldwide. 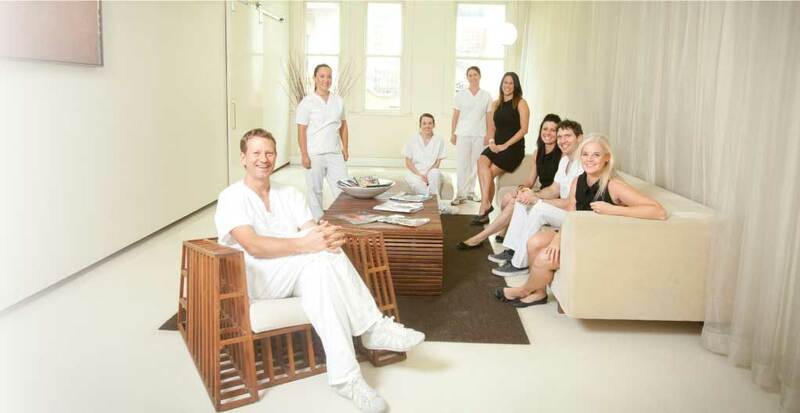 Rotondo dental has been practicing dentistry at the highest level in Brisbane for over 25 years. Copyright © 2018 Rotondo Dental Trust. All rights reserved. All-on-4™ | Malo Clinic Brisbane. 4.9 out of 5, based on 21 reviews on Facebook.